Hampshire, IL – June 23, 2015 – The horses and riders of Canterbury Farm just concluded three fantastic weeks of competition at the Showplace Spring Spectacular horse shows in Wayne, IL. Competing at the Lamplight Equestrian Center from June 2-21, 2015, the Canterbury team continued a great start to the season with more wins and top prizes to add to their collection. Owned by the Franklin Family, and operated by head trainer Greg Franklin and trainer and rider Caitlyn Shiels, Canterbury Farm is a hunter/jumper training facility based in Hampshire, IL. With its convenient location just 20 minutes from the Lamplight Equestrian Center, everyone at Canterbury Farm was able to participate in top-notch competition throughout the month, while also enjoying the comforts of home. The greatest story of this year’s Showplace Spring Spectacular was the incredible development of Natalie Alden’s King of Hearts. At just six years of age, this beautiful Hanoverian gelding took every challenge in stride to win the $10,000 USHJA National Hunter Derby, sponsored by Old Barrington Farm, over two rounds of competition during week three. Ridden by Shiels, King of Hearts finished second in round one with an impressive score of 96 out of 54 entries. As one of the top twelve competitors, he then advanced to the handy round, where he scored an amazing 97 to win the class with 193 points overall. The second placed competitor finished six points behind with a score of 187. To make the week even better, Shiels and King of Hearts went on to win the $1,000 Pre-Green Incentive Stake with a high score of 86. Later, the talented young horse carried his owner, Natalie Alden, to a win in the $500 WIHS Children’s Hunter Classic. Until this winter, King of Hearts had been competing as a jumper, but when he made his debut in the hunter ring in Florida, he immediately caught Shiels’ eye. King of Hearts was originally entered in the derby to gain experience as he prepares for the Pre-Green Incentive Championships coming up in August, but the young horse exceeded expectations. Along with her success aboard King of Hearts, Shiels had an exciting moment with her own young horse, Cavalier II. The eight-year-old gelding made his grand prix debut after showing in the first two Welcome Stake classes. Shiels bought Cavalier as a six-year-old two years ago. She saw a video and knew the horse’s potential right away; she never even went to try him. Another up-and-coming jumper talent, Janet Walker’s Dare to Dance showed with Shiels throughout the Spring Spectacular, and made an exciting move up to competing at the 1.30m level for the first time. In the hunters, Canterbury client Michelle Durpetti watched her brand new horse, Serafina, compete to great ribbons in the Pre-Green Hunters with Shiels in the irons. The eight-year-old KWPN mare came to Canterbury just a few weeks ago and has adjusted well to her new team. While Shiels had success with her own mounts for Canterbury Farm, she also helped coach many of the riders to excellent results. Showing with Canterbury Farm, Lesley Quillen and her horse, Timeless, earned an exciting championship tricolor in the Amateur-Owner Hunter 3’3” division during week two. The pair won two classes over fences and placed third in another. They capped it off with a sixth place ribbon under saddle. Other top results came from Marcia Franklin’s Cydelle and Madeline Pogorzelski. The pair earned the reserve championship in the Modified Children’s Hunters in week two, with a win and two second place ribbons over fences, as well as a fifth place under saddle. In week three the duo placed third, third and fourth over fences in the Modified Children’s Hunters. They also placed third in the $1,000 Modified Children’s Hunter Classic. Natalie Alden had success competing with Sheree Holliday’s Vocarday during the Spring Spectacular as well. The duo won a class in the Children’s Hunter 15-17 along with other consistent ribbons. The whole team at Canterbury Farm will take two weeks off to rest before traveling to their next equestrian destination as the summer carries on. Everyone is excited for the next stop in beautiful Traverse City, MI, from July 8-26 for three weeks at Flintfields Horse Park. 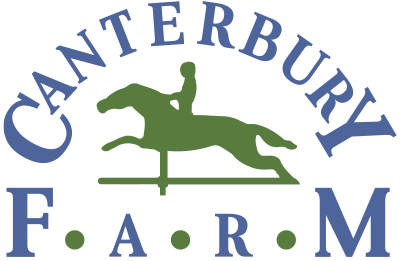 Canterbury Farm maintains a horse show schedule on a local, regional and national level that is created with their customer’s competitive goals in mind. For over 35 years, Greg Franklin has ridden hunters and jumpers to numerous championships nationally and has brought home many Zone 5 Horse of the Year awards. Franklin has qualified horses and riders for the Pennsylvania National, Washington International and the National Horse Shows including the Medal and Maclay Finals. He has also shown internationally at Spruce Meadows in the 1.40 and 1.45 divisions and is a certified trainer with USHJA. Additionally, Franklin has his ‘R’ in Hunters, Hunter Seat Equitation, and Jumpers and judges throughout the country. Born and raised in Sheffield, Massachusetts, Caitlyn Shiels began riding at the age of 8. A highlight of Caitlyn’s career as an emerging talent includes being a double gold medalist in both the team and individual NAYRC In 2004. After achieving this success, Caitlyn apprenticed under such professionals as Andre Dignelli, Mclain Ward, Ken Smith and Kate Stoffel-Oliver to name a few. She joined the Canterbury team in 2013, almost immediately after becoming a part of the team, Caitlyn and Greg began enjoying great success with multiple championships at major shows including Spring Spectacular, Horse Shows by the Bay, Traders Point Charity Horse Show, and Kentucky. Their partnership is an excellent balance of training both on the horse and from the ground. Thank you to sponsors Tucci, Samshield, Butet, O’Shaughnessy Apparel, Blueberry Hill, Ardie Hastey, and Equifit. Photos copyright Andrew Ryback Photography and Chicago Equestrian. Photos may be used only in relation to this press release.